Review: This is a great inexpensive way to add headset jacks to the back seats. They could have done a better job designing the connections to minimize tangling, but this is easily fixed with some zip-ties. We plug it into the co-pilot side, route it along the floor, and then plug the kids into it in the back. That way it doesn't have any chance of interfering with the pilot's ATC communications. Review: Works great for a passenger or two in the back seat when plugged into the passenger jack of my 2 place intercom. Needed to put a zip tie or two on each pair of plugs and cords right near the plugs to keep everything in order otherwise it tangles up. Once done, it stays in place and doesn't tangle. Review: Love this product and you need to have this with limited plugs in the cabin. Best you can have and this company is GREAT!!!! Review: This product is great for all parties to listen to on line discussions. It did however diminish the quality of the external transmissions to tower and Center such that we were unable to communicate effectively. We overcame this by connecting the headset adapter to the non-transmitting pilots intercom system. Review: This is a nice product to expand the number of headsets in small GA aircraft. I was able to take a plane with 2 headsets and haul 4 people each with their own headset. Cons: cords need to be organized with zip ties, but is easy to do. Q: For use with the co-pilot's connection to the aircraft's mic/phone connections, does this have any impact on electric load, avionics, or any other considerations for a 1983 Seneca II (PA34-200T)? or for example, would it reduce the quality of radio communications, for the pilot, with ATC? 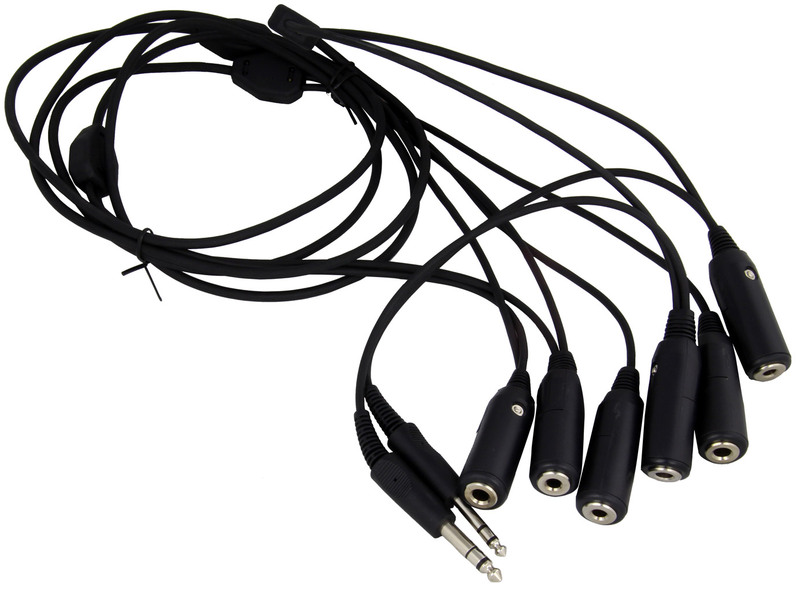 A: As more headsets are plugged in to a single set of jacks, those jacks provide a bias voltage to power the microphone. As more and more headsets are put in-line, the voltage obviously drops and the last headset gets less bias voltage than the first. However, this usually is not a problem with only 3 headsets plugged in to one set of jacks. When you start getting to 5 and 6 headsets this may be a factor. If you have additional technical questions on how this is wired, I would have you contact Pilot USA (the manufacturer) and see what they have to say. You can reach them at Email: info@pilot-usa.com / Phone: 888-467-4568. Q: How long are these cables. Ex. From the main input to first headset jack, from that jack to the next, and that jack to the next? A: Hello, The cable, starting at the input male plugs, to the first headset jack is 11". From that jack to the next is 66" and that jack to the last one is also 66".